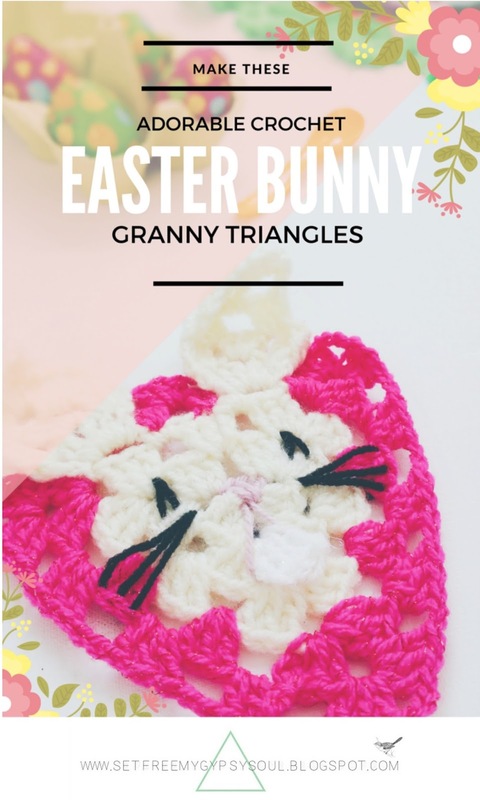 Have a Hoppy Easter with this 3D Easter Bunny Rabbit face Granny Triangle crochet pattern. 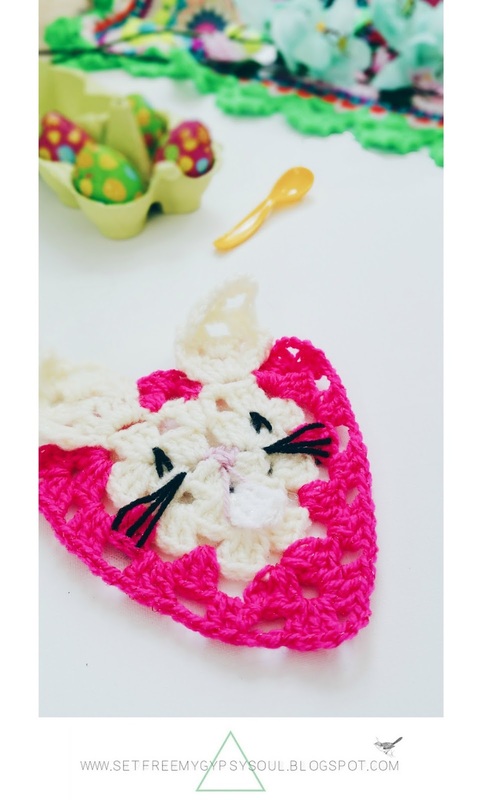 Work up a bunch of these cute little Bunny Rabbit Faces and make a baby blanket or string together to make Easter Bunting Flags for your Easter Egg Hunt decorations. I used a 4.5 mm hook and Aran/Worsted weight yarn for the Bunny Rabbit's face as DK or softer ply yarn doesn't work and just makes a floppy bunny. You can use DK for the rest of your work though. For this project you will also need a yarn needle and you can see my tutorial for how to make a Granny Triangle by clicking here. 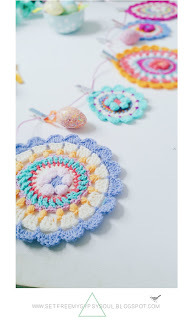 Crochet terms are in UK and US and remember any questions, don't hesiate to ask! You can find me on Instagram @setfreemygypsys0ul and across social media. Click here for more. Pick a colour for his nose, make a magic loop and ch 3. This counts as your first treble (US double). 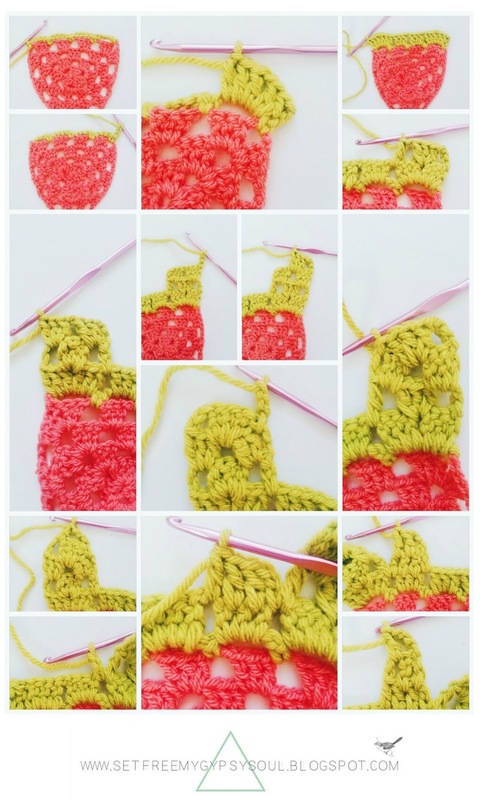 Make one treble (US double) crochet into the loop. Start to make another treble (US double) but switch your yarn into the colour you chose for his face before pulling through the last two loops. Trim off your 'nose' yarn leaving two tails. These will be used later. Continue with basic Granny Triangle pattern for 3 rounds. 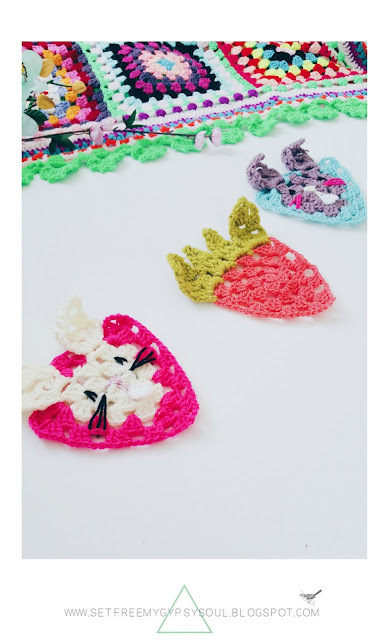 Join your final stitch of the Granny Triangle with slip stitch but don't cast off yet! 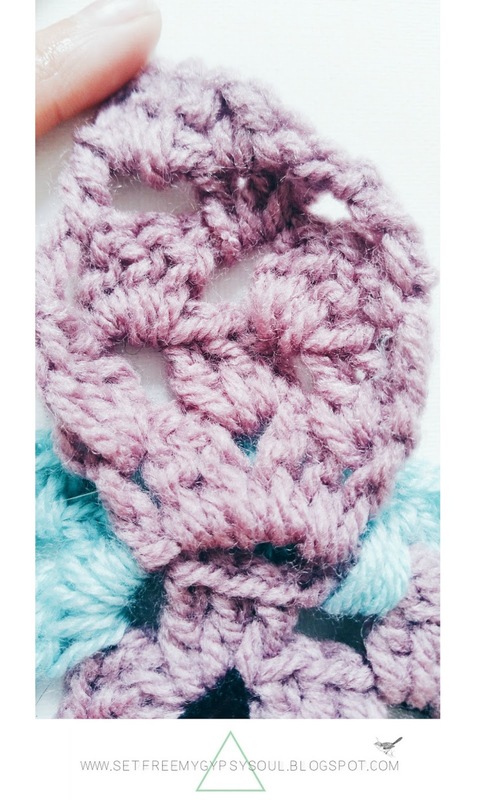 Slip stitch across into the next chain space, and chain 5 joining to the corner with a double crochet (US single). Chain 3 and into your new loop make 2 treble (US double) crochets and then chain 1. Make another 3 treble (US double) cluster into the same loop space. Turn your work and chain 3. Make another treble (US double) cluster, ch 1 and a 3rd treble (US double) cluster into the end chain of the cluster below. Make 2 trebles (US double) and ch 1, followed by another treble (US double) cluster into the next chain space. Join to the last chain of the cluster below using a double (US single) crochet. 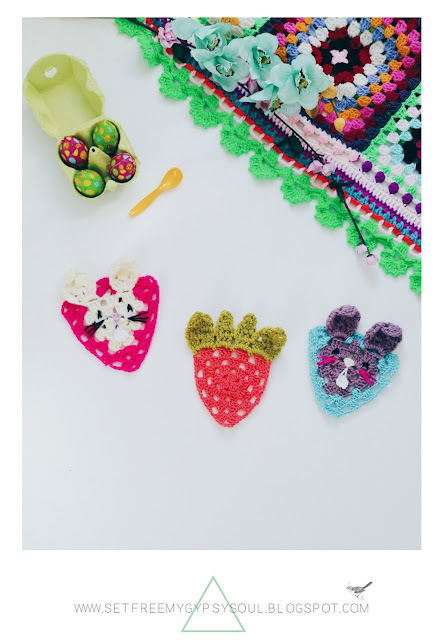 Work a treble (US double) cluster into the chain space followed by a htc (US hdc) into the next chain space and a single crochet into the next chain space. Cast off with slip stitch. For ear number 2, cast on and repeat on the other side. Cast on in the space between your corner treble cluster on round 2 of your Granny triangle. Chain 3 followed by 2 more treble (US double) crochets and cast off. Weave in ends. Add two rounds of a contrasting colour as you would a regular Granny Triangle, folding down the ears as your work. Thread your yarn needle and make a V stitch across the corner holes of your 2nd round of Granny trebles. Add 3 long stitches out to the 1st round of your contrasting colour - I found keeping them in line with the crochet stitches made sure he was symmetrical. Remember those tails we left when making the bunny rabbit's nose? Pull those through the the front with your hook, thread your yarn needle and make two stitches either side of his teeth. 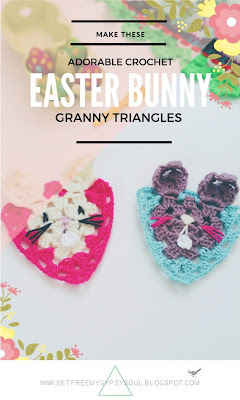 And there's how to turn a crochet Granny Triangle into an adorable Easter Bunny Rabbit face. Add a shell border to create pretty bunting flags and mix them in with Easter Egg Mandala's for bright and colourful Easter Sunday Egg Hunt decorations. Using the same principle you can also make cute little carrots! 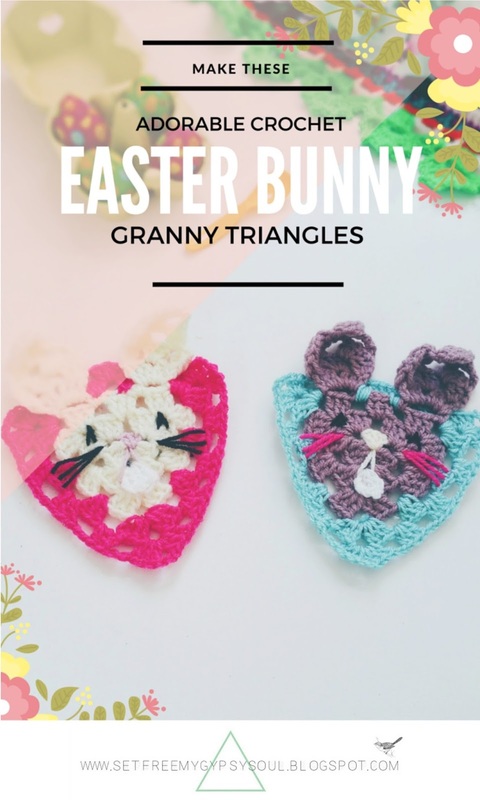 I hope you have a wonderful Easter weekend and enjoy crocheting these adorable Easter Bunny Rabbit face and Carrot Granny Square Triangles. 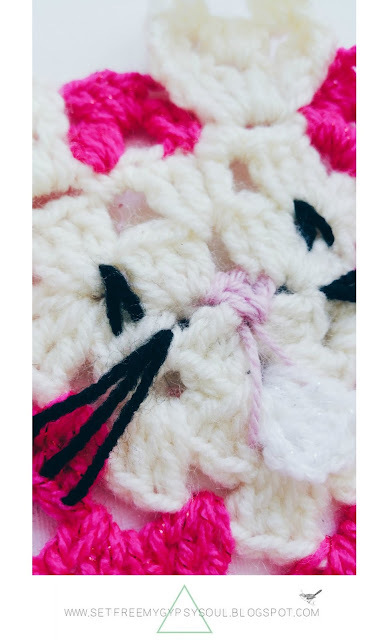 If you liked this free crochet pattern, I'd love it if you would share with your friends, family and fellow #crochetaddicts. Oh now cute! 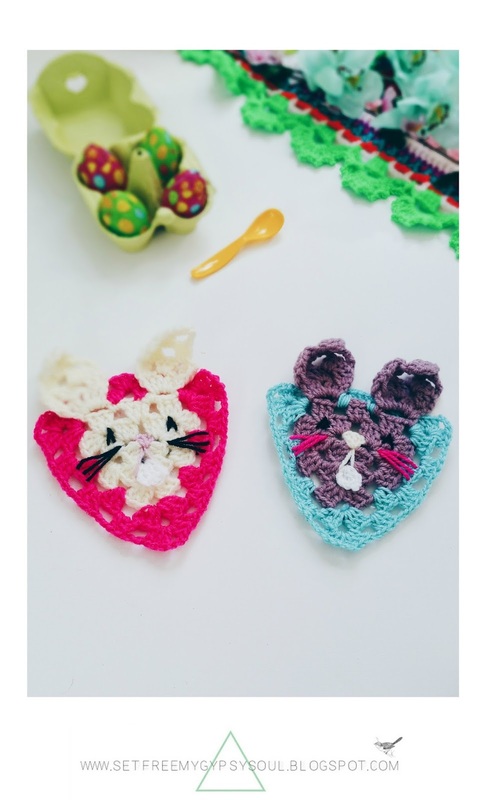 These little crochet bunnies would be perfect for an Easter basket!